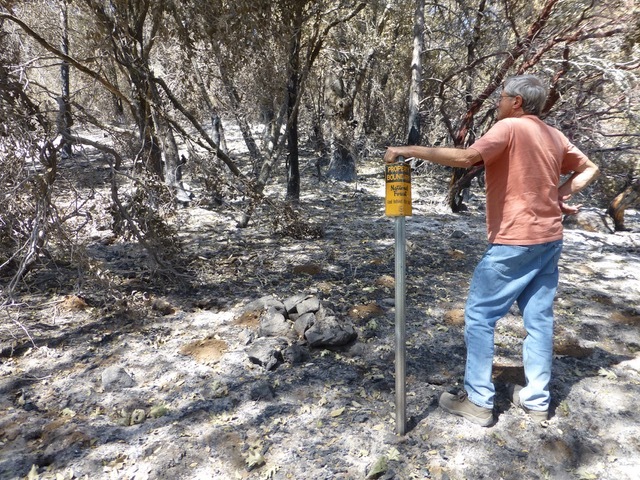 My father examining fire damage in the National Forest at the boundary near my childhood home. Last month, the Ferguson Fire in California’s Mariposa County marched over 20 miles to my childhood home. The battle raged for days as firefighters fought, literally at our doorstep, to save the house. Thankfully, no one put a price tag on saving my home. The firefighters that charged up the mountain at 2 a.m. didn’t demand payment. They didn’t check anyone’s credit scores. To do so would have been cruel. I think we need to follow that principle not just when the fire is burning, but also by helping people take steps to keep their home safe before the next fire comes. Over the years, my family had the good sense – and the resources – to prepare. The house is fire hardened, with a fire-resistant roof and defensible space. With some matching grant money, we also had the forest on our property thinned and brush removed. The result was that the fire slowed when it arrived, perhaps giving firefighters time and space to save the house. If our house had burned, it would have made it very difficult to save the other homes below us on the mountain. My family had cleared brush, thinned the forest, and hardened the house. This slowed the fire, reduced the damage to the forest, and might have saved our home. This is not complicated stuff. You can read about fire hardening on the CalFire website: readyforwildfire.org/Hardening-Your-Home. But these projects can be costly, and many of the folks in rural areas are low-income households. The result? Most families in rural California cannot afford to make their homes safe from wildfires. Families shouldn’t be in greater fire danger just because they are poor. In Florida, thousands of low- and moderate-income homeowners have used 100% private capital to make their homes safe from a hurricane through the use of PACE financing. Now, California Senator Hannah-Beth Jackson is leading the effort to allow PACE financing for fire hardening as well. California is the birth-place of PACE and has taken the lead in passing strong and clear customer protections for all PACE programs. This proposed extension of PACE for fire hardening (SB 465) is another step forward in California’s leadership in providing broader access to affordable private financing to pay for critical home safety and energy improvements. PACE can allow thousands of homeowners to protect their homes, and their communities, without any public subsidy. Senator Jackson’s bill will help families and firefighters by giving homeowners the ability to harden their homes against fire. The Ferguson Fire is finally contained, more than a month after it first got started. It burned over 90,000 acres and a dozen homes. Two firefighters died fighting the blaze. Other fires in the State continue to burn and we are just now entering the height of the fire season. We know that climate change is making wildfires bigger and more common. This time, my family was lucky. We were lucky the firefighters were able to save the house, of course. But we were also lucky because we could afford to protect it from the fire in the first place. I hope that by fire season next year, a lot more families can make the improvements we made, and turn the luck in their favor.